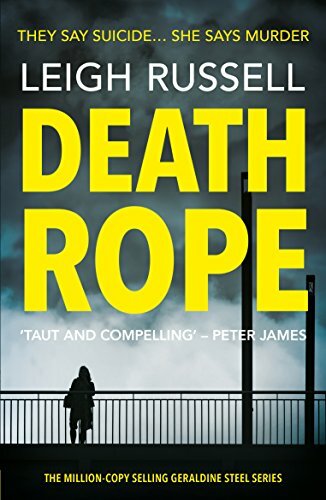 Leigh Russell is back with a new, complex case for Geraldine Steel to solve in her latest novel Death Rope. We’re taken into the heart of a family crisis and Geraldine must unpick the damaged relationships and expose a killer. Charlotte Abbott returns home to find that her husband has committed suicide and his body suspended in the air in their hallway, hanging from the banister. The police have no reason to suspect that foul play has been committed until his sister, Amanda asks Geraldine for her help as she believes that there is no way her brother committed suicide. As Geraldine begins to quietly investigate the case, more suspicious deaths begin to occur, and the victims all appear to know each other. Are Amanda’s instincts right and is there more to this case than meets the eye? This case was tricky for Geraldine right from the start. She faces opposition from the police for wasting police resources on a cut and dry case and from the victim’s own family. The family at the heart of this mystery are an unusual group of people and there is more than one suspect who could have a strong motive. Leigh leaves plenty of room for guesswork and I was always questioning the reasons why the victims had ended up dead. There is some excellent characterization in Death Rope and I thought this was the case particularly with Eddy. Leigh explores some very tense moments with him which I thought were executed to perfection. Although he wasn’t a very pleasant character I did feel for him and I wanted things to start going right for him for a change. Reading the final chapters of this book was a very chilling experience, you won’t want to look away until you have turned the final page. The Geraldine Steel books have now become one of my must-read crime series. This is the second book in the series I have read and both times the plot has left me feeling very satisfied and eager to catch up with the previous books which I am hoping to get round to reading very soon. This comes recommended from me. Thank you to Katherine Sunderland at No Exit Press for inviting me to take part in the blog tour and for providing me with a copy of the book to read.